Good evening, dear readers, and happy Friday! I have my final post from my Adventures at CosmoprofNA series to share today, and I'm getting a little teary that it is all over. This trip was such a wonderful experience for me, and I loved every minute I spent chatting with such wonderful representatives from each of the companies. Deciding how to write these posts and the order to present them to you has been a little challenging at times. For my final post about CPNA 2014, I wanted to share my experience visiting the Bernadette Thompson booth in addition to some gorgeous polish and the last polish remover you will ever want to use. Before I spam you with pictures, let me tell you a little about my time there first. 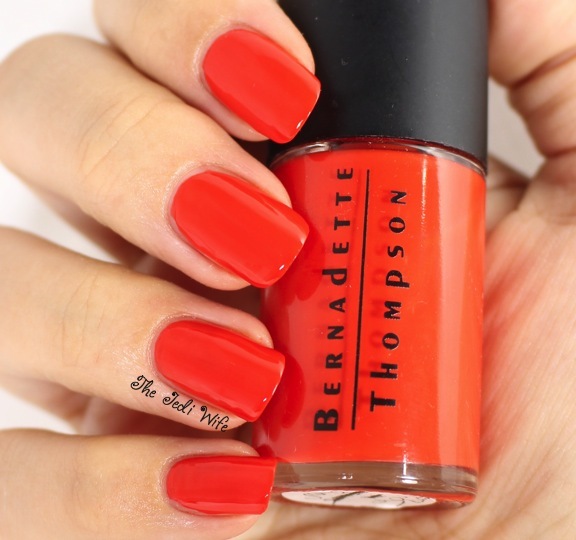 Bernadette Thompson is a celebrity manicurist who has launched her own line of colour and nail care products. It was such a pleasure getting to talk with Bernadette herself, and I wish everyone could have the opportunity one day! She is a vivacious woman filled with personality, and she definitely could have been my partner in crime when we were kids! Bernadette has such a friendly disposition, and I hope we are able to cross paths again one day. 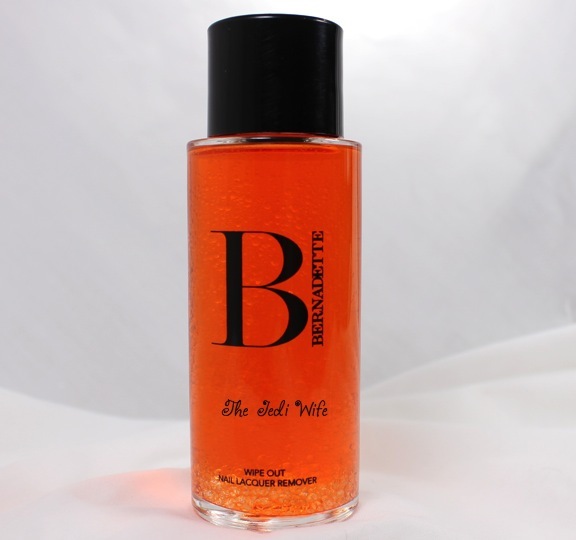 While at the booth, Bernadette gifted me several bottles of her polish and her nail polish remover to test out. I'm eager to share it all with you today, so let's get to some photos! I never thought I would see the day that I would be excited writing about nail polish remover. I use a lot of remover: some with acetone, some without, but none has really wowed me before Bernadette's Wipe Out. As you can imagine, I use *A LOT* of remover with swatching and doing nail art on my blog. Acetone-based removers have always worked the best at removal, but it is so drying on my nails and cuticles. The non-acetone removers usually take forever and a day to remove polish, and I just don't have the patience for it when I have a lot of swatching I need to do. Wipe Out is an acetone-free remover with avocado oil. This bi-phase formula easily mixes together with a quick shake prior to providing a thorough, yet moisturizing, removal of polish. I love how quickly it works to remove lacquer from my nails, but my cuticles don't get dried out! As of this post, my bottle is almost empty. I could easily go through a jug of this fabulous remover and I would love to order it by the gallon. Naughty is a slight pink-leaning coral polish, but it is pulling more coral against my olive skin tone. The application was smooth, and it dried quickly for me. I used two coats of polish and a coat of HK Girl topcoat for these photos. Sky's the Limit is a lovely light blue polish, and I was impressed with how densely pigmented it was! I used two coats plus top coat for these photos, but I think one coat would have been plenty! I just adore the iridescent flakes in this baby! There are some small iridescent glitters mixed in as well for good measure. The flakes and glitters spread easily over the nail, and I used a coat+ (one coat plus a couple touches in more open spots). I topped it off with top coat as well for these photos. Wealth is *the* perfect brown shade for fall. It has a red-leaning base, so it may look a little more red on other skin tones. I love the golden shimmer. The shimmer is subtle but more apparent than my camera was able to capture. I used two coats plus top coat for these photos. 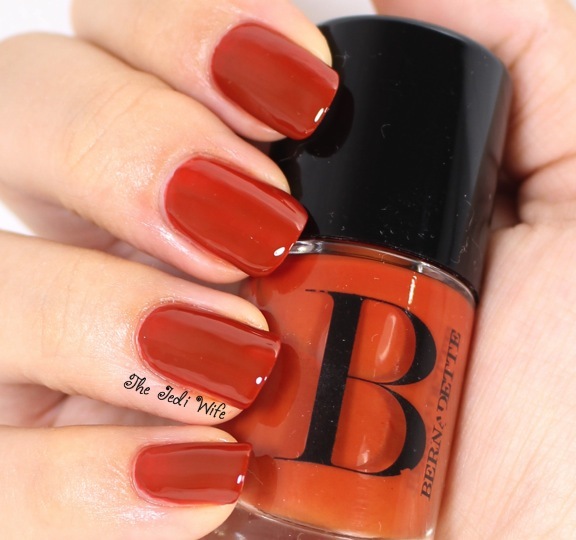 I am going ga-ga for this gorgeous spicy burnt orange shade! 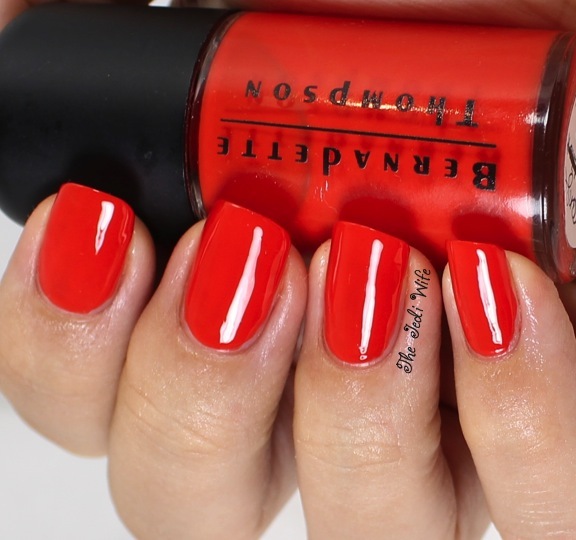 This particular shade is new and was created on set with actress Claire Danes. 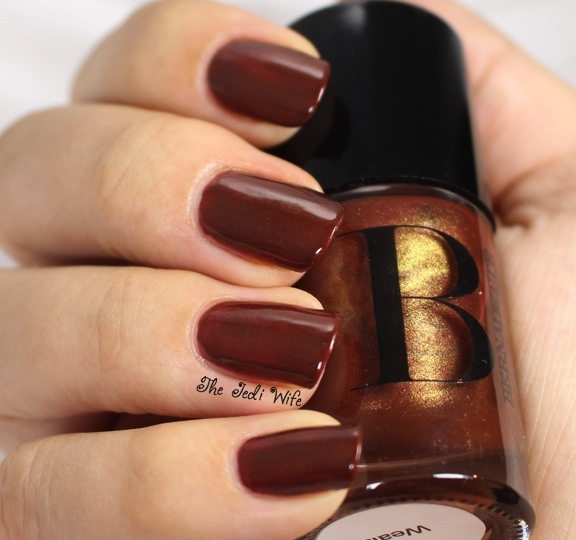 It is stunning and another shade that I will be wearing a lot for fall! The formula on this one was a little more sheer, and I used three coats plus top coat for these photos. Yes! Another orange shade! Orange You Lucky is an orange-coral shade, and another great fall shade. I used two coats plus top coat for these photos. I wanted to do a little nail art with some of these polishes. I used Orange You Lucky for the base. One my middle and pinky fingers, I added Diamonds are Forever. 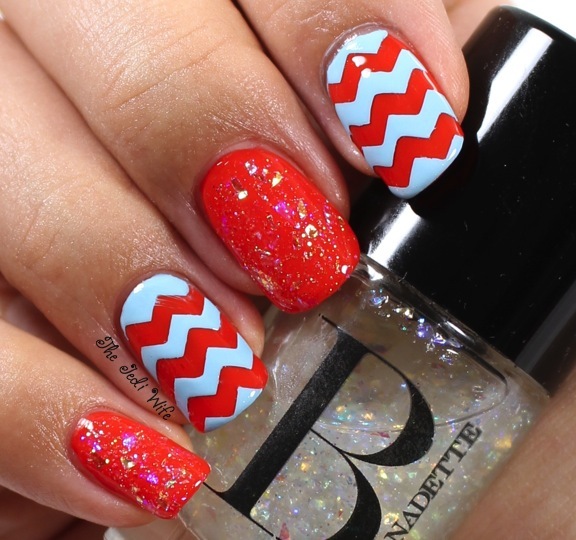 I then used chevron NailVinyls and topped off my index and ring fingers with Sky's the Limit. I finished off my manicure by adding HK Girl topcoat. I really like how this came out! I was a little unsure at first, but I like the fire and ice contrasting look. I hope you have enjoyed today's blog post, as I bring my series about the brands I visited at Cosmoprof North America 2014 to an end. In case you've missed anything, you can check out this link (which is also one of the tabs along the top of my blog now) for a list of brands I have covered in addition to the corresponding link to each individual post. Until next time, dear readers, have a wonderful day! Disclaimer: The opinions in this blog post are my honest and unbiased opinion. All thoughts stated are entirely my own and based on my experience with the products. I love receiving feedback from my readers, and any comments left here are the express opinions and/or property of the individual commentors. Therefore, I, the author of this site, cannot be held responsible for the opinions held by others. I reserve the right to remove any comments that I find to be harmful, unnecessary, or not constructive for other readers. Hi Jen, It was a pleasure meeting you at Cosmoprof. 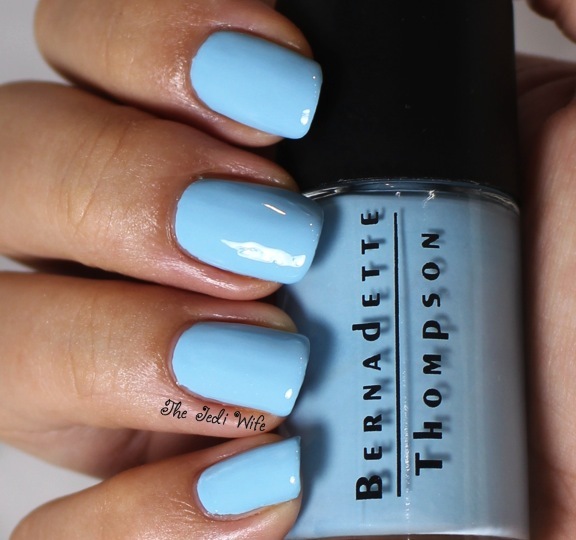 I see all of your great nail art images using The Bernadette Thompson Collection. Thank you and I will keep you post when new products are in the making.